PT Satelit Palapa Indonesia (SATELINDO) chose Hughes Space and Communications Company in April 1993 after an eight month competition. The spacecraft, called Palapa-C, are versions of the successful HS-601 model of body-stabilized satellites. Construction was done at Boeing Satellite System's manufacturing facilities in El Segundo, Calif. Boeing also augmented the new master control station at Daan Mogot near Jakarta. 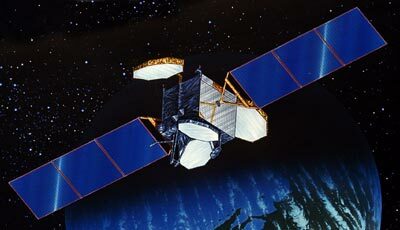 The first satellite was launched on Jan. 31, 1996, on an Atlas-2AS booster and placed at 113° East longitude. The second was launched on 15 May 1996 on an Ariane-44L H10-3 rocket from Kourou, French Guiana. The rockets carry the spacecraft to geosynchronous transfer orbit. The spacecraft's own liquid apogee motor then raises it to geostationary orbit 36,000 km above the equator. The Indonesian satellites carry the name "Palapa," a word that signifies unity. The country has more than13,000 islands, and satellites are the most efficient and effective way of uniting them with communications services. Each succeeding generation of Palapa satellites was significantly larger and more powerful than the one it replaced, as demand for services grew. Each Palapa-C spacecraft, for example, carries 30 C-band transponders, compared to Palapa-B's 24. In addition, the new satellites carry four Ku-band transponders for business networking. Each Palapa-C satellite has 24 active and six spare C-band transponders to operate in the 3700-4200 MHz/5925-6425 MHz range, and six active plus two spares in the extended C-band region (3400-3640 MHz/6425-6665 MHz). The former are powered by 21.5 watt solid-state power amplifiers and the latter by 26 watt SSPAs. In Ku-band, each satellite was built with six-for-four redundancy, and 135 watt traveling wavetube amplifiers for operations in the 10950-11690 MHz/13750-14490 MHz range. Average radiated power in C-band is 37 dBW; in Ku-band, it is 50 dBW. The coverage area includes not only Indonesia, but also southeast Asia and parts of China, India, Japan, and Australia. Like other HS-601 model satellites, Palapa-C is built with a cube-shaped central body that contains the electronics payload and supports the antennas and two solar wings. From the tip on one three-panel wing to the other, each satellite extends 21 meters (68.8 feet). These wings provide 3,730 Watts of power. The satellite carries three antenna systems comprising four octagonal-shaped reflectors and their corresponding single feedhorns. The four are shaped reflectors with dua lsurfaces to process signals with both horizontal and vertical polarization. The shaped-reflector technology precludes the need for multiple feedhorns. The antenna systems provide coverage in the standard C-band (two85-inch reflectors), extended C-band (one 70-inchreflector), and Ku-band (one 60-inch reflector). The HS-601 body is composed of two main modules.The bus module is the primary structure that carries launch vehicle loads and contains the propulsion, attitude control and electrical power subsystems. The payload module is a honeycomb structure that contains the payload electronics, telemetry, command and ranging equipment, and the isothermal heat pipes. Reflectors, antenna feeds, and solar arrays mount directly to the primary module, and antenna configurations can be placed on three faces of the bus. Such a modular approach allows work to proceed in parallel, thereby shortening the manufacturing schedule and test time. After an electric power anomaly had occurred, the Palapa C1 satellite apparently lost its ability to recharge batteries. A Battery Charge Controller is no longer functioning, which means that the satellite is without a power backup during the eclipse periods that occur twice a year. The satellite was declared unusable for its planned mission, insurance claims were paid, and the title of the satellite was passed to the insurers. Hughes Global Services acquired the satellite, and developed procedures necessary to maintain full geostationary service operations except during eclipse itself and brief periods on either side of each eclipse event. For a total of 88 days per year, the satellite has to be switched off for three hours per day on average. Overall availability of the spacecraft's transponders remains at 96 percent. The satellite was renamed HGS 3, later Anatolia 1 and in 2002 Paksat 1. Palapa C2 was to be replaced by Palapa E at the end of its life, but the replacement was cancelled. The satellite was retired in 2016 and was moved into a graveyard orbit above the geostationary belt.